Nothing says summer like a perfectly roasted marshmallow. Ditch the twigs and become a marshmallow roasting maestro with Outdoor Roastings Perfect Marshmallow Roasting Sticks. Perfect for an open campfire – Outdoor Roastings has quality cookout tools for Hot Dogs, S’mores, Kabobs and anything else you’d want to cook over a campfire or eat under the sun. The Perfect Marshmallow Roaster keeps the marshmallow secure with two skewers and an elbow hook, so it doesn’t quit rotating with the roaster. With a unique patent-pending design, the Perfect Marshmallow Roaster stick has twin skewers turned inward, making them safe for children. The backward facing prongs also create a resting stop for hot dogs, shrimp, kabobs or Marshmallows so they don’t fall off or slip as you are turning or roasting them over the fire. It doesn’t matter what a pro you are at roasting marshmallows – you’ve probably lost a few perfectly golden toasted marshmallows to the bottom of the campfire. When roasting marshmallows with a traditional roasting stick, the middle gets soft and melts off the stick and quits spinning with the roaster – worst case scenario falling off. Not anymore, when roasting marshmallows or hotdogs over the fire on the Perfect Roasting Stick, they slide deeper into the roasting hook and rest in the elbow – instead of slipping off into the fire. The tines point toward the handle so that the end is not a dangerous device in the hands of children. Outdoor Roasting started about 10 years ago to solve the two problems all other roasting sticks have. First, as soon as the marshmallow heats up and softens it stops turning with the stick. The second problem is the marshmallow, or whatever you’re roasting, is off-center so as you turn the stick the marshmallow moves away towards the heat. The “Perfect Marshmallow Roaster” solves both of these problems. The perfect roaster has two small diameter skewers just 3/16”, this keeps your marshmallow turning even when the inside has become gooey and soft. The roaster was crafted so that the marshmallow is directly in-line with the main shaft and handle. Therefore, as you turn the roaster the marshmallow stays in the same place. Everyone form the rugged backpacker to the s’more loving kid will appreciate the Perfect Marshmallow Roasting Stick. Ideal for toasting marshmallows to that perfectly caramelized outer shell, this roasting stick also works perfectly for anything. (Hot dogs, shrimp, kabobs, polish sausage and etc.) It can roast up to four hot dogs at a time. Made of high quality and durable materials, the stainless steel and wood handles durable materials that will last as long as the rest of your camping gear. As much as you might be tempted by the price tag of bargain plastic handle roasters – you’ll wish you would have invested in some quality roasters when you find yourself replacing them when the plastic cracks or the metal becomes tarnished. Outdoor Roasters crafted in a overdue safety design. The tines point toward the handle so that the end is not a dangerous device in the hands of children. Because the tines poke inward, the roasters are also better for storage and won’t poke holes in your sleeping bags when you’ve got all your camping gear stowed away. 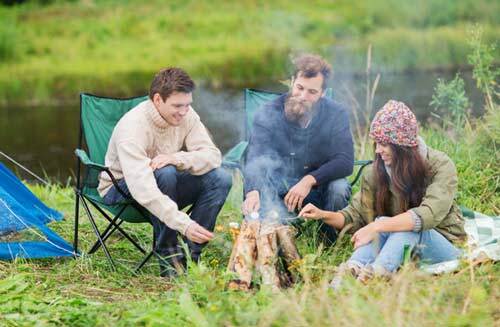 At OutdoorRoasting.com we are all about creating enjoyable, fun, and memorable experiences around the campfire for our customers. Our focus is to provide customers with high quality campfire roasting sticks that are made specifically for roasting camp foods. The tines turn inward, protecting your sleeping bags or other camping gear when travelling or in storage. While most companies focus on manufacturing roasting sticks as cheaply as possible, we put a lot of thought into the design of our campfire roasters as well as ensuring durability and quality in both materials and how our products are crafted. The customer is at the forefront of our business, and everything that goes into the roasters at OutdoorRoasting.com is done to create a perfect experience for outdoor enthusiasts.